When you’re travelling for more than just one day, the last you want to think about while on the road is your back pain from all of that heavy load. Sometimes you may find in the position of liking a lot the idea of the backpack, but you’re not really going for all that carrying it in the back. The solution comes from the wheeled backpacks that combine the functionality, the build and features of a regular backpack but their wheels make them so easy to carry around, with no strain for your back or shoulders. 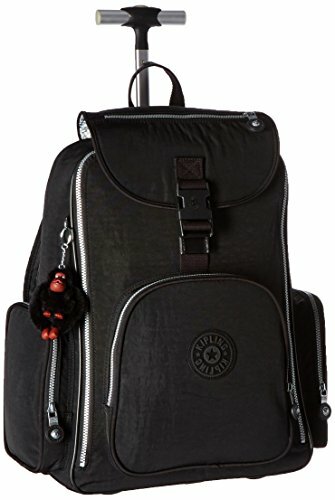 How to choose a good wheeled backpack? There are a couple of things you need to check when choosing a wheeled backpack and it’s important to remember them when shopping. For instance, you want your wheeled backpack to have an easy handle retraction. Many times when you’re travelling you are on a hurry so you want the pull handle to retract easy and fast. No matter if it’s your kid at school or you when you’re travelling, you need a wheeled backpack that is at least water resistant. It’s only a matter of time until you may travel on a rainy day, after all. 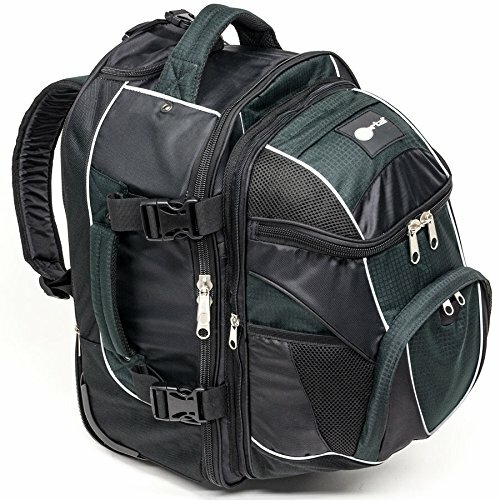 Don’t forget to check the features, the zippers, the storage space of your wheeled backpack. You want efficient organization, easy access and zippers that never get stuck. 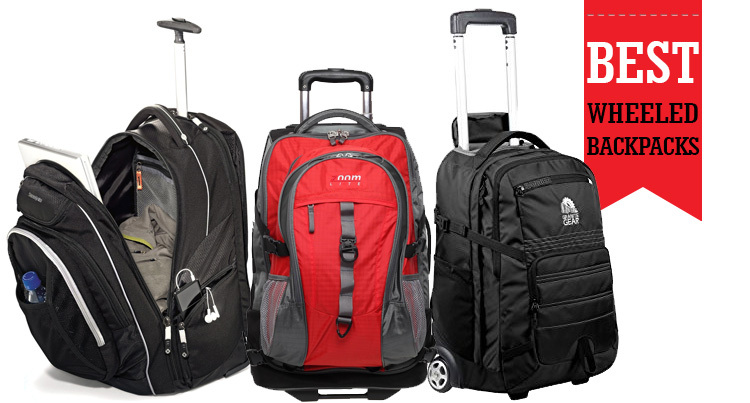 You also want the wheeled backpack to come with a compartment in the back that is holding the straps when not in use. Some straps dragging on the ground is the last thing you want to have when you’re in a hurry to catch your flight. Last, but not least, check the build of your wheeled backpack. You want one that is sturdy, rugged and ready to take a fall or some less careful handling. 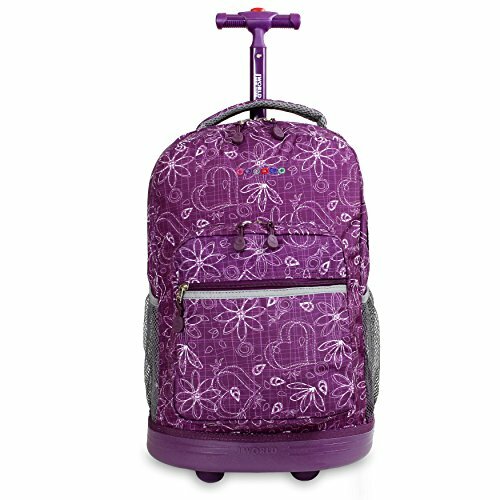 Pretty colored and fun to get for school, the J World New York Sunrise Rolling Backpack is very popular and reliable. The backpack is made with 100% polyester and fits a standard locker. Its ergonomic S-shaped shoulder straps are easy to adjust and comfortable. The back panel is air mesh cushioned so your kid doesn’t end up all sweaty after a long time carry. The slip-in system is efficient and makes use a breeze. The wheels run smooth and quite, giving a controlled motion. The “feet” on the front give good stability to the backpack so it doesn’t fall down. The handle runs easy as well and has a tree stage locking with push button, taking the repeated use. The organization of the backpack is good and it present a front pocket with pencil holder, key fob and a mesh pocket as well. Not only the backpack is dependable, but it’s also nice looking and the one-of-a-kind color matching mold protects against wear and tear. The attention to details is great and each wheel is embedded with the logo, for a fancier look. Despite the problems, for the cute looks, reliability and ease of use, the wheeled backpack is a great choice for many schoolers out there. large and presenting a multi-compartment design, the High Sierra Chaser Wheeled Backpack is worth to try for plenty of reasons. The backpack isn’t just made with good quality materials, but it’s also easy to use, taking a beat pretty well. The backpack has an organizer compartment with several pockets and a key fob. The design is well thought out and you get quick access to the zippered accessory pocket. The backpack has several open pockets and a headphone port. The in-line skate style wheels are rolling nice and easy every time and the single-tube telescoping handle takes the intense use. It presents two locks deign for height adjustment and locks in place. It’s also easy to hide away when not in use. As for the wheels, they’re corner mounted and run quiet. The shoulder straps have a nice contoured shape and are easy to adjust for better fit. They are made with vapel mesh padding for more comfort and tuck away inside the back when not in use. Additionally, the back panel is well cushioned so the strain on your back is minor. The list of features also includes a hook on the outside so that you may attach more gear. The backpack is good quality and its main compartment is quite large. Giving all the good things, we’d say the wheeled backpack is still a sure buy when travelling or going to school. 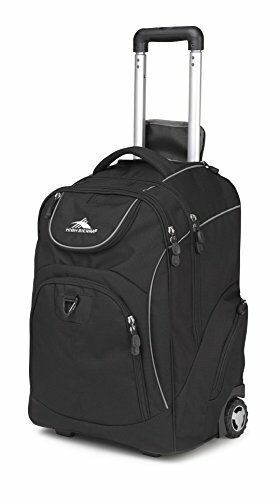 If ever in need of a wheeled backpack with a laptop compartment, put your money at stake with the High Sierra Powerglide Wheeled Backpack. The backpack is quite large and presents a multi-compartment design. Its fully padded computer sleeve fits most 15” laptops and you get many storage spaces. You may safely use the Deluxe medial pocket with headphone port and the multiple pocket organizer with key fob. The front compartment is large and zippered so you can fit many of your personals. You may also use the zippered side pockets for a water bottle or various gear. Don’t hesitate to attach a lock or other accessories to the triangle clip either. The double-tube telescoping handle stows inside a zippered compartment when not in use. Flush-mounted, the handle takes the intense use and is made with padded mesh for increased comfort. The mesh padded shoulder straps are easy to store behind a zippered back panel. The back panel is also padded and tough. The shoulder straps are contoured and easy to adjust, made of Vapel mesh. The corner-mounted wheels roll pretty smooth and have an in skate design. The backpack features a kick plate that protects against abrasion and reflective accents for more visibility at night. Nevertheless, we’re staying focused on the good and recommend the backpack for various needs. Looking for a wheeled backpack that is a bit more than a wheeled pack? Give it a go with the Portal Navigator Hybrid Wheeled Carry-On Backpack with Detachable Daypack and you’re surely find it useful in so many situations. The impressive flexibility is what we like the most about this navigator hybrid. The backpack includes a zip off day pack so you may go lightly when in need. The backpack is made with Rip stop fabric and looks quite nice, without losing the tough build. 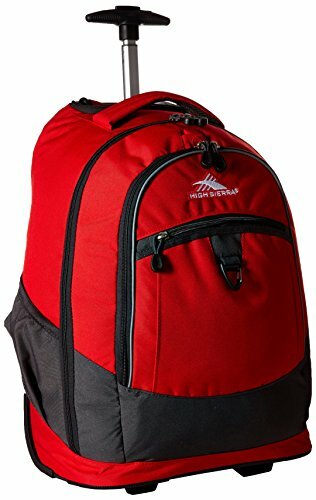 The design of the backpack is well thought out and the pack comes with hidden straps and wheels that give you the chance to carry it a lot easier when in a hurry. The organization is efficient and you may use the organizer panel for the small personals and the beverage pocket in so many situations. The construction is durable and the backpack is going to take the intense use for quite some time. The zippers slide easy and tough. The padded carry handles are also rugged and the seams have a durability feel. The wheels roll nicely and look good. The backpack is well made and folds down flat for easier storage. For the versatility, good build and impressive list of features, the backpack is one dependable choice for so many situations. 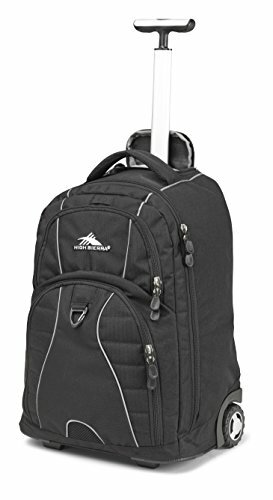 Sturdy and well made, the High Sierra Freewheel Wheeled Backpack is one of the most popular choices out there and you only need a sec for scrolling down and checking the detailed look. The wheeled backpack is made with Duralite Rip stop and takes the intense use and even a light rain. It presents a large, multi-compartment design so you or your high schooler may have a good organizing of your items. The computer sleeve is fully-padded and fits most 15” laptop and the backpack also includes a Deluxe media pocket with a headphone port. The shoulder straps are also well padded, increasing the comfort when carrying the backpack on the back. They’re placed behind a zippered back panel that is also padded. The backpack also features a side beverage pocket and a triangle clip for attaching some extra gear when in need. The corner-mounted wheels are smoothly rolling and the telescoping handle has a hideaway design. The single-tube telescoping handle hides easy inside a padded back panel when not in use and it’s easy to pull every time. The Vapel mesh padded grab handle is useful and makes the moving around quite easy. The list of good features isn’t done yet and we have to mention the reflective strip that make the backpack and the one carrying it visible. The corner guards and a kick plate protect the backpack against abrasion. The zippers are tough and complete the image of a tough, reliable wheeled backpack. Despite the minor issues, the wheeled backpack is one of the best options you can get for this kind of money. If ever in need for a wheeled backpack that is also nice looking, not only functional, take a leap of faith with the JanSport Driver 8 Core Series Wheeled Backpack. 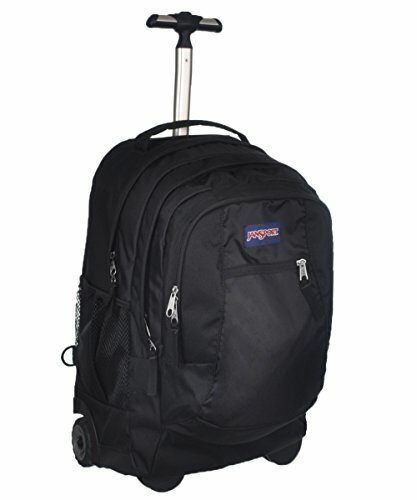 The backpack is 19” high and 14” wide and is a wheeled travel piece all in one. The shoulder straps are padded and you may easily tuck them whenever in use. You may also safely carry your laptop since the backpack features a padded laptop sleeve that is large enough to fit a 15” laptop. There’s plenty of room for your personals as the backpack has two main compartments. The front drawbridge compartment is large and has an organizer, and you get to use also the front zippered stash pocket and the side water bottle pocket. The back panel is well padded so it’s also comfortable to carry the backpack. The large side mounted action wheels have smooth traction and good stability. The two-stage handle is easy to retract and takes the use for a good amount of time. The backpack is well made and has a sturdy feel. It’s large inside and dependable for travelling in style. All in all, the backpack is a dependable, functional and good option when you want to travel in style. Even though you may be feeling like paying the extra buck for it, the Kipling Alcatraz Solid Laptop Wheeled Backpack is a wise investment of your money. The backpack is made with high quality materials and is waterproof, which counts so much on a rainy day. The organization is great and the backpack features a 15” laptop sleeve with Velcro closure. This way, your laptop is easy and safe to carry all the time. The front zippered pocket has a mesh-lined interior pouch pocket so you get to carry safely even the more fragile items. You get more storage space thanks to the two side zipped pockets and in case it’s still not enough for you, the open back pouch pocket is very large and functional. On top of everything else, the flap cover top features one zipped pocket and a buckle closure for carrying your items safely every time. The straps don’t drag on the floor and the wheels run smoothly every time. The handle is long and easy to use, taking the intense use. The backpack is well made and comes in nice colors. Regardless of the flaws, the backpack is easy to use and great for organizing all your items for the trip/school.